WELLESLEY, Mass., Sept. 19, 2017 /PRNewswire/ -- 4G Clinical announced its recognition today as a finalist in the 2017 Scrip Awards for its RTSM solution, Prancer. 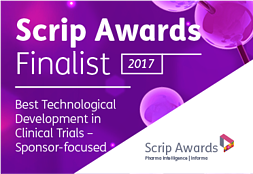 Shortlisted in the ‘Best Technological Development in Clinical Trials – Sponsor-focused’ category, 4G’s Prancer was developed using agile software methodologies on the latest technology stack and uses advanced natural language processing (NLP) to bring speed and flexibility to clinical trials. Prancer’s novel technology accelerates study start-up by transforming the system build process, allowing sponsors to support increasingly complex protocols while adapting to new information, including protocol amendments and evolving regulatory requirements, seamlessly without trial disruption. This Scrip Award recognizes the vital importance of using the most sophisticated platforms to catalyze and optimize data gathered during clinical trials. Advances in software and applications have a pivotal role to play at all stages of the trial process, assisting sponsors in effective management of study logistics, monitoring, risk mitigation and timely data collection and analysis. Judge criteria for selection include products or suites of products that help study teams better manage and oversee clinical activities. For more information, visit www.scripawards.com. 4G Clinical is a full service RTSM company focused on simplifying and accelerating the drug development process. The company was founded in October, 2015, to develop a service offering centered around a 4th generation Randomization and Trial Supply Management (RTSM) system, Prancer. Headquartered in the heart of the Boston biotech corridor, in Wellesley, MA, 4G Clinical has facilities and staff located in the U.S. and Europe, and offers global expertise and advisory services to pharmaceutical companies and contract research organizations.